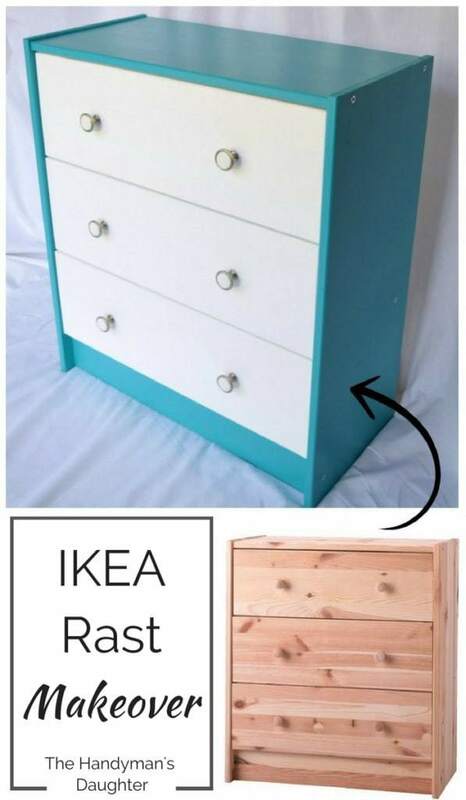 The IKEA Rast dresser has got to be one of the most hacked pieces of furniture on the Internet. It’s amazing how this simple set of pine drawers can be re-imagined in so many different ways, from a bar cart to an apothecary cabinet. I was looking to add some storage to our basement office, so I just had to transform one of my own! This post may contain affiliate links for your convenience. To more information, please visit my disclosures page. 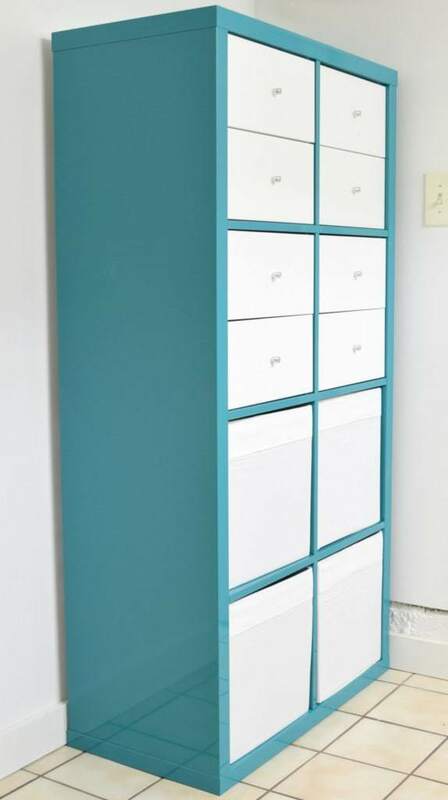 I took the color inspiration for my dresser from another IKEA piece we already owned: a bright turquoise Kallax shelving unit with white drawers and bins. I moved the Kallax from my former sewing room down to the basement to be used as storage for my overflowing workshop. These two pieces of furniture will both be an integral part of a big makeover project I’ll be showing you all soon! Our basement office, where the IKEA Rast and Kallax will be living, is located right off the workshop. The colors in that room are so neutral, it needed a big splash of turquoise to brighten it up. The floor is boring beige tile, the walls are stark white, and there are no windows to give it natural light. Yawn. Long-time readers of The Handyman’s Daughter know that painting furniture a bright color like this is quite the departure from the norm for me. Almost everything I paint is white, white, white! Believe it or not, I actually love color. Typically I keep the majority of a room neutral and add pops of bright colors that can easily be changed out when the mood strikes. Turquoise is my favorite color, so I wasn’t afraid I’d tire of it anytime soon! 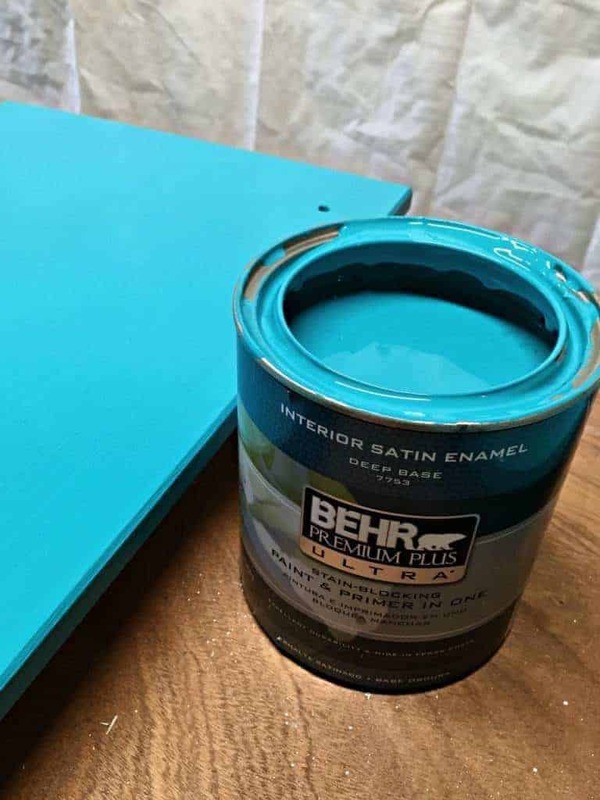 After picking up every turquoise paint chip I could find, I settled on Paradise Landscape by Behr. It matches the color of the Kallax perfectly! All the dresser frame pieces received this cheerful color, which I painted before assembly. 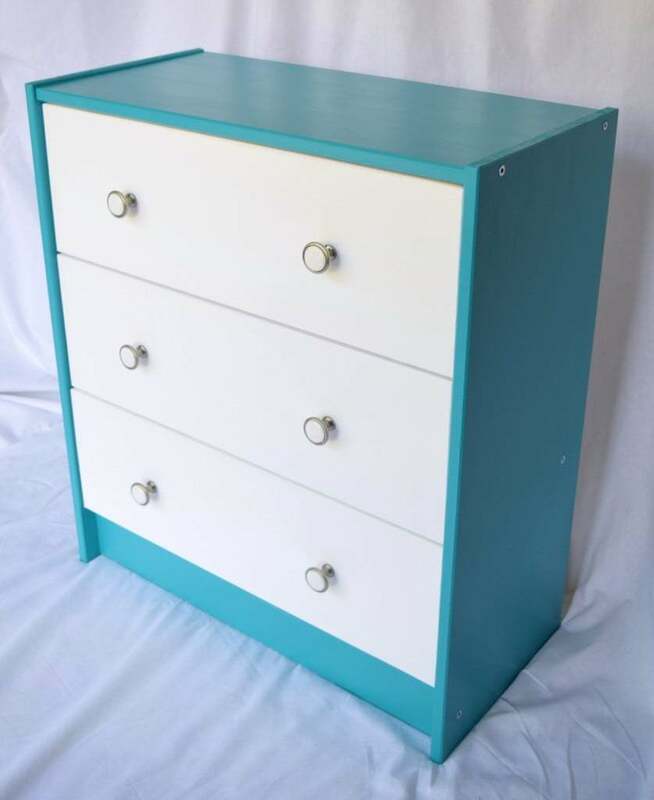 The drawers and back of the dresser were painted white to match the inserts on the Kallax (see, I had to add white somewhere!) I had quite the surprise when I attached the backing: It doesn’t cover the entire dresser! Oh, IKEA. I know your stuff is cheap, but would it have killed you to make the backing just a little bit longer? Sigh. Normally I wouldn’t care too much, but the back of this dresser will be visible in the final project. I decided to add a piece of 1/4″ plywood I had left over from making my floating shelves. 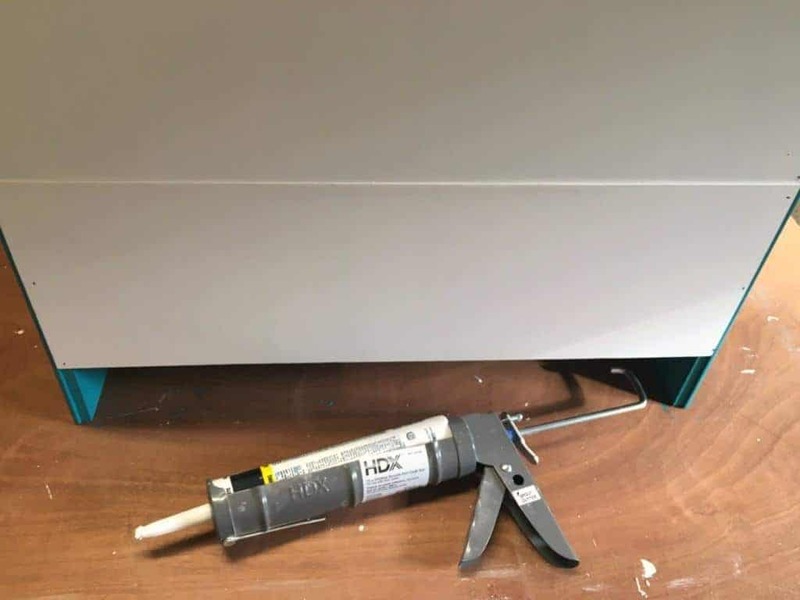 The scrap was just wide enough to cover the bottom drawer. I caulked the seam between the two pieces to make it a little less obvious. At first, I planned to just paint the wooden knobs provided. However, when I attempted to attach one of them to the drawer, it split in two! Ugh, IKEA is determined to drive me insane with this project! I rushed out to the hardware store and picked up these cute little white and nickel ones instead. You can also find them on Amazon here. For the finishing touch, I decoupaged this beautiful paper I found at our local art supply store to the bottom of the drawers with Mod Podge. 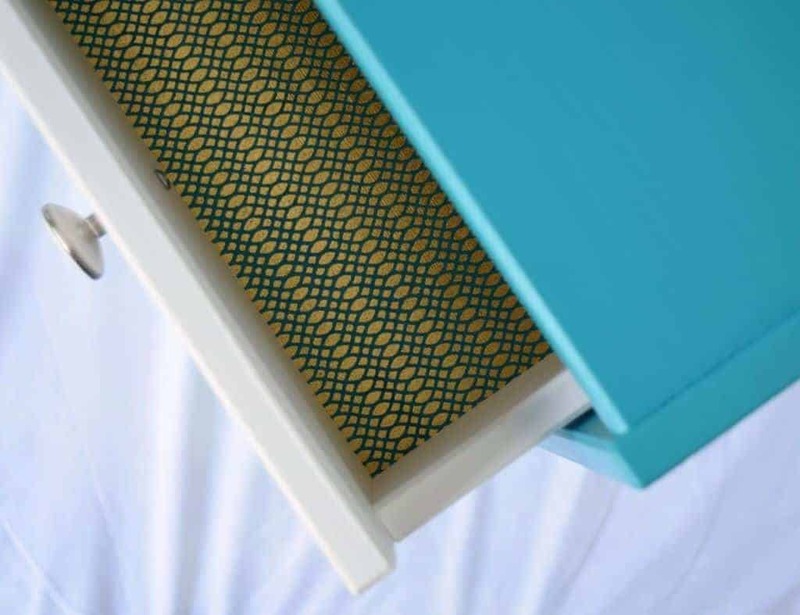 The blue in the pattern matches the dresser perfectly, and I love the little surprise you see when you open the drawer. 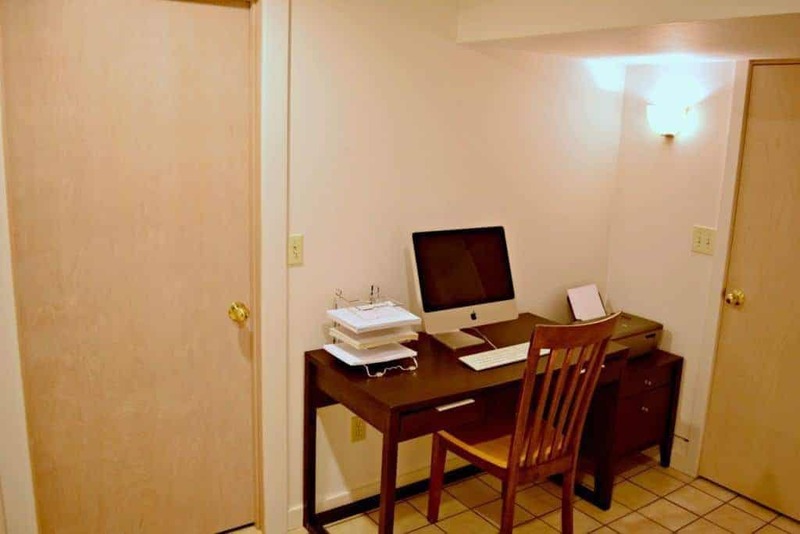 This bright, cheerful IKEA Rast is a breath of fresh air in our boring basement office! I can’t wait to show you what it will look like when the entire project comes together. Be sure to check back at the end of the month when I reveal my $100 room transformation! I just linked up! Thanks for mentioning it! Thank you for sharing with us! Pinned! Love this and I admire your paint job. Do you use a sponge roller? 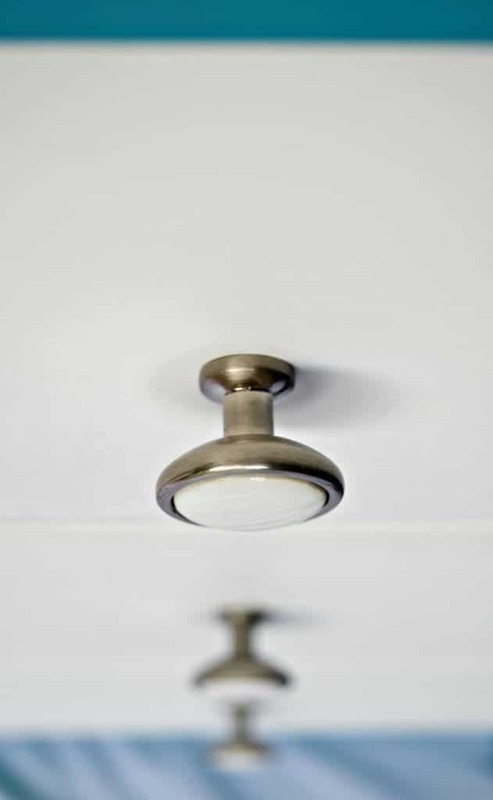 It is hard to get such a smooth finish. I enjoyed how you showcased the other turquoise piece as well. My studio is due for an update. So glad I stopped by via Creative Circle and soaked up so much inspiration. I also liked your pin in now feature. Genius. 😀 I would like to come up with my own version of that idea. If I do, I will credit it back to you and your motivating idea. I just used a regular paint brush, but the trick is to paint everything before assembly. Painting all the pieces when they’re flat is so much easier and lets the paint even out nicely. Glad you like my pin it feature. I just started using it, so it’s nice to get good feedback on it! I love, love, love that color!!! Those are two great pieces for your office!! I can’t wait to see the big reveal of room makeover!! Thank you for sharing at TaDa Thursday!!! Hi. We Featured your makeover at Snickerdoodle Create Bake Make Link Party today! Hope you can stop by!